These light blueberry cookies also feature lemon zest and almond extract for a flavorful combination. Nutrition Highlights: Per serving: Calories – 58, Total Fat – 2.3g, Sodium – 25mg, Total Carbohydrates – 8.8g, Protein – .7g **Nutrition information is calculated using an online calorie calculator. Variations may exist. Values are based on a 2,000 calorie diet. In a large mixing bowl, cream shortening and sugar. Add egg, milk, almond extract and lemon zest, mixing well after each addition. In a separate bowl, combine flour, baking powder and salt, and gradually add to creamed mixture, blending well. Fold in blueberries. Drop dough by teaspoonfuls 1½ inches apart onto greased cookie sheet. Bake for 12-15 minutes. Cool on cookie sheets before removing. Linked up at Tempt My Tummy Tuesday, Show Me What You Got Tuesday, Trick or Treat Tuesday, Totally Tasty Tuesdays, and Tuesday’s Treasures. 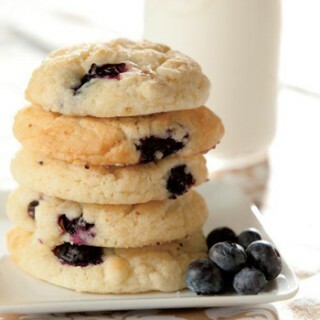 Your Blueberry Drop Cookies look delicious! Love these cookies what a perfect Spring or summer cookie.. Thank you so much for sharing it with us on foodie friday. Pinning it. I love blueberries! I haven’t seen them in a cookie before. I’m glad I found your blog throught Foodie Friday! Thank you so much for sharing this recipe with Foodie Friends Friday. I like using fresh fruit in recipes and this cookie with fresh blueberries is perfect for spring parties. Made these for my husbands company picnic and they were a hit!!! What a great recipe. I had to substitute the almond extract for vanilla because I am allergic to almonds. Glad you enjoyed it! I had to do that same substitution because I didn’t have any almond extract on hand. I think it works just as well!